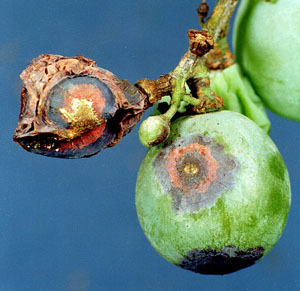 Anthracnose is a grape rot disease, caused by fungus Elsinoë ampelin. 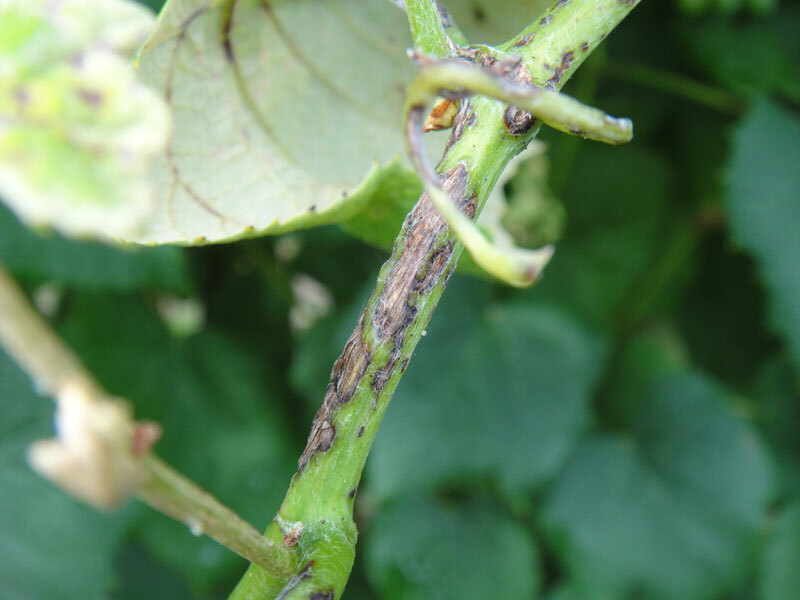 It’s also known as bird’s-eye rot due to the look of the symptoms that appear on the infected plant. Disease is widely recognized in rainy, warm and humid climates, and can be very destructive once occurs in the vineyard. 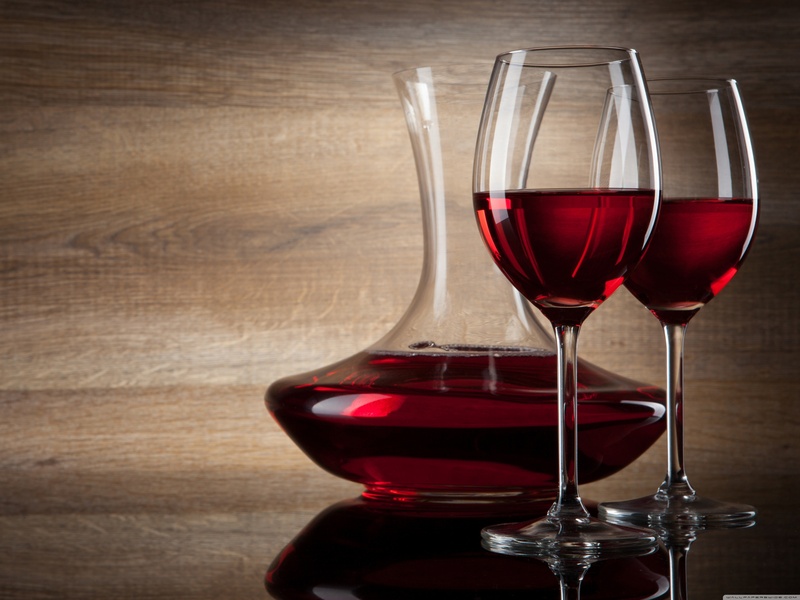 It reduces fruit quality and quantity, and weakens the vines. Most winegrowers are familiar with the symptoms on shoots and berries, but Anthracnose can attack also fruit stems, leaves, tendrils and petioles. Disease is more dangerous when it occurs on young leaves. Infected leaves are usually full of spots with grey centers and brown to black margins, with round or angular edges. Grey center of the spots eventually dry and drops out, so leaves look like they were shot through. If spots cover the entire leaf or affect leaf veins the whole leaf eventually dries out. Symptoms on shoots first appear as small, round, reddish spots. Eventually, the spots enlarge, and generate grey centers with reddish brown to black margins and round or angular edges. On infected lesions, shoots can crack and become brittle, or die out. Berries can get infected anytime between pre-flowering to veraison stage of development. Similar as on the shoots, also on berries symptoms of infection first appears as small, round, reddish spots. After some time spots enlarge and appear as “bird’s eye” – with grey centers and reddish brown to black margins. Infected spots can then extend into the pulp and cause cracking of the berries. Under the favorable weather conditions fungal fruiting bodies develop in the lesions, and appear as pinkish spores. The Anthracnose fungus overwinters in infected shoots, canes and/or berries. In the spring, when there are favorable wet weather conditions, spores called conidia develop. These spores are then spread around with the rain. Infection time depends on moisture and temperatures; heavy rain and warm temperatures are ideal for the disease development. Optimum conditions for primary conidia infection are 12 hours of moisture and temperatures in range between 2°C and 32° C. Symptoms of the disease develop 13 days after the infection if the temperatures are around 2°C and after 4 days if the temperatures are around 32° C. After disease occurrence, the asexual fruiting bodies (acervuli) appear on infected areas and produce conidia during the wet weather. These conidia’s are then the source of secondary infections. Anthracnose can be efficiently controlled by the use of good cultural practice. Removal and destroying of infected plant parts, and elimination of infected wild grape near the vineyard, are crucial for disease management. Planting resistant varieties and improvement of air circulation practice, such as proper training system and leaf removal, are helpful as well. If Anthracnose does appear in the vineyard, then fungicides sprays, such as sulfur or copper, can be used. 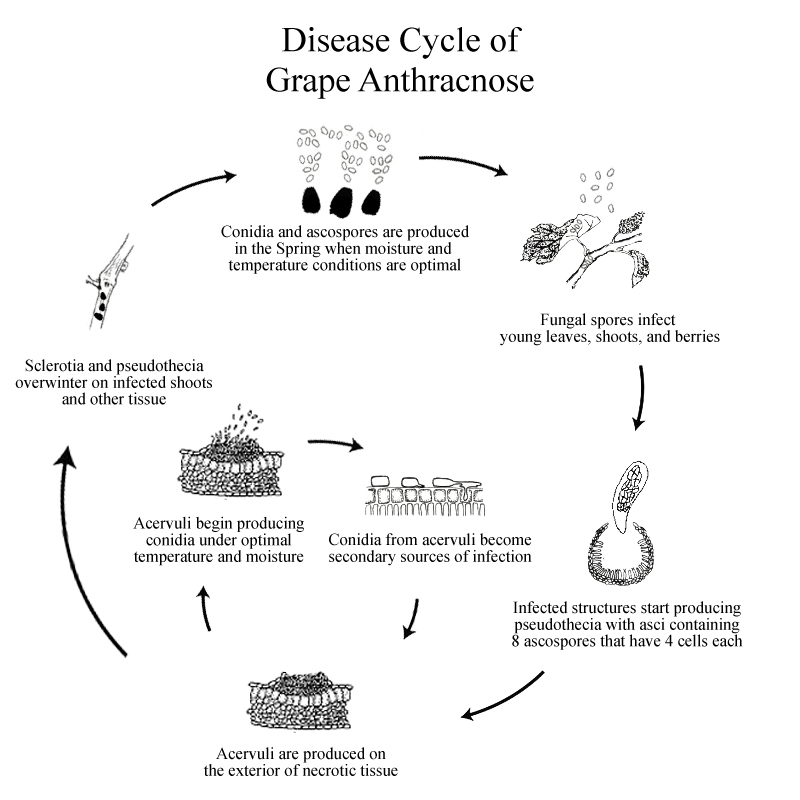 Anthracnose is a grape fungal disease that thrives in rainy and warm weather conditions. Risk of infection is increasing with the rise of the temperature. Disease mostly affects berries and young shoots, but may also occur on all others succulent part of the vines. 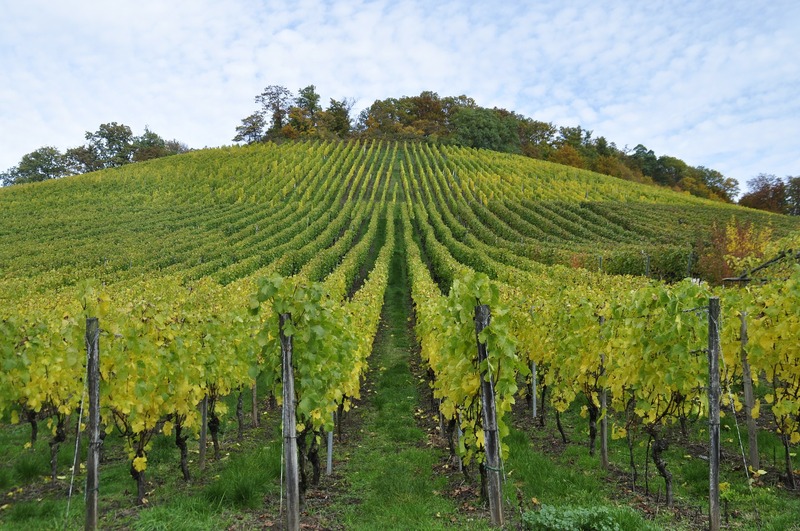 It is not that hard to control the disease with a good cultural practice, plus there is a vineyard management support system – eVineyard that can gives you timely and punctual advice on how to do that in your vineyard. Are you familiar with the symptoms of the “bird’s eye rot” and its disease management practices? Is there something you would like to add? I live near Baldwin Wi. I have anthracnose multiplying. The 110 black walnut stand is probally not helping. Your description of the condition is precisely like mine. 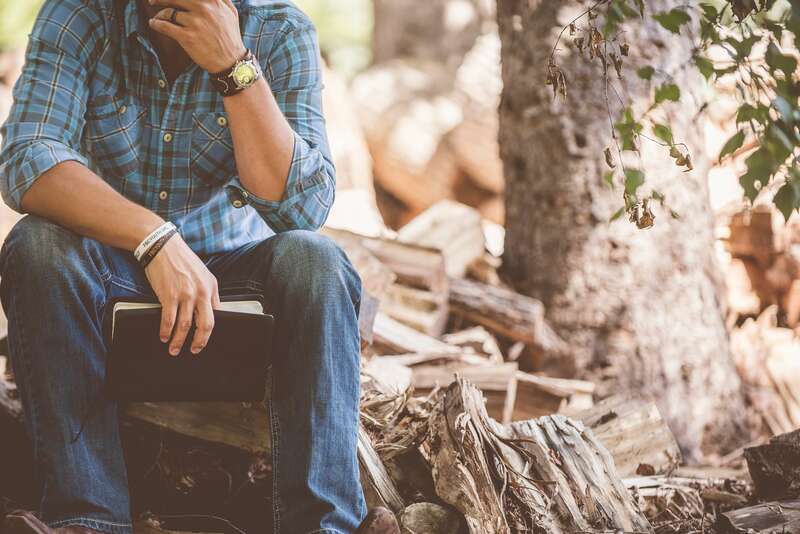 It’s ok stop by for agricultural purposes and maybe your valued knownledge can be helpful. Hello Bill, thank you for your comment. Unfortunately, we are not in Baldwin. 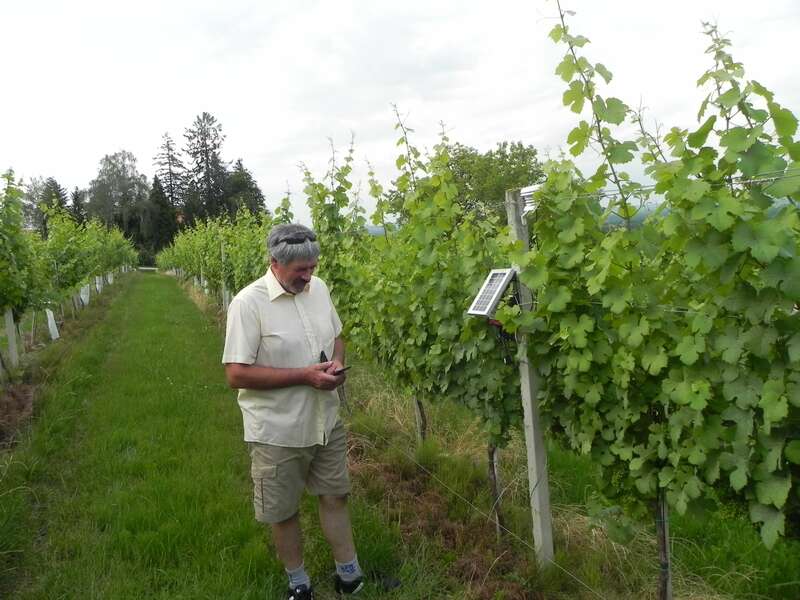 We provide vineyard management software – eVineyard that can help you determine the time of Anthracnose development according to the weather data so that you can take timely protective action.